GBS Laptop Service Center In Chennai provide quality Laptop repair services for all model Laptops - Acer, Apple, Dell, Hp, Lenovo, Toshiba at Reasonable Cost. Our professional technician has many years of experience to handle any laptop related problems. We are experts in broken Laptop repair/rework, motherboard chip level service, broken laptop LCD screen repair/replacement, laptop spare parts upgrade. 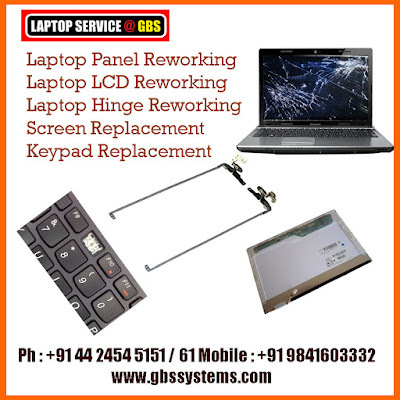 Currently we provide laptop repair services in and around chennai region - Tamil Nadu : OMR, KK Nagar, Tambaram, Chrompet, Anna Nagar, Adyar, Madipakkam, West tambaram, Porur, Thoraipakkam and Velachery & Karnataka - Bangalore For Any model laptop issues need services or spare parts, simply logged the complaint for Laptop repair Estimate and we will schedule and pickup your Laptop, our technicians will help you with the Repair Cost with-in 24Hrs. Alternatively, Call +91-9841603330.